I have had the opportunity to meet some amazing bloggers through Taste As You Go, some personally and some virtually via Google Reader and Twitter. In an attempt to introduce my readers to some bloggers they may not already know about and to highlight the writing skills of some incredibly talented people, I will be featuring Guest Posts on Taste As You Go from time to time. Today's Guest Post was written by Nancy and Matt Shields. I've been friends with Nancy on Twitter for what feels like years and years and she's always been very encouraging with regard to m blogging efforts and supportive of my personal pursuits as a half-marathoner-in-training. When you're finished reading Nancy and Matt's Guest Post, you should check out their blog, Food Tastes Yummy! Thanks for writing, guys! Hello, Taste As You Go readers! Matt and I wanted to thank Michelle for letting us do a joint Guest Post on her blog. Although I've never met Michelle, I follow her on Twitter, and through this venue, I got to know a little more about this fellow "food enthusiast." I've enjoyed her tweets and welcomed the invitation to do a guest post here on Taste As You Go. On my site, Food Tastes Yummy, I post a variety of home recipes (usually being yesterday's lunch, dinner or dessert), and like Michelle, I like to make sure that there is always a picture of the completed dish. After all, everyone eats with their eyes first. I believe that home cooking is not rocket science and people shouldn't go out of their way to make it so. I say, keep it simple. Matt and I also think this way about pairing food and wine. There are far too many rules out there about what wine goes with what type of food. We say good food and good wine is really what you make of it. 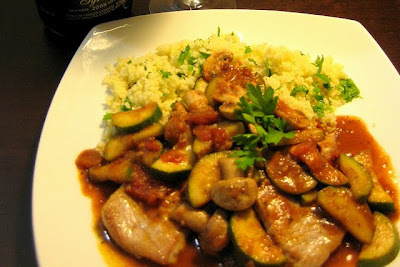 So, with this in mind, I will go on to post my recipe for Seared Pork Cutlets with Mushroom and Zucchini in a Red Wine Tomato Pesto Sauce on Lemony Couscous. Matt will pair this dish later in the post with his recommendation for an affordable wine. Preheat a non-stick skillet on medium-high heat. Drizzle 1 tablespoon of olive oil and sear the pork cutlets, about 3 minutes per side. Season with salt and pepper. Place the seared cutlets on a plate and place a piece of aluminum foil on top to keep warm. In the same skillet, drizzle another tablespoon of olive oil and saute the mushrooms, zucchini and tomatoes for about 2 minutes. Season the vegetables with salt, pepper, vegetable blend seasoning and the dried thyme. Once you see the tomatoes start to break down, pour in the 1/4 cup of red wine and spoon in the sun-dried tomato pesto. Stir the ingredients all together to combine. Once the alcohol has cooked out and the sauce has thickened, turn the heat off. Plate 2 cutlets per person and pour the veggies and sauce on top. Serve immediately. In a heat-proof bowl, add in the dry couscous and the boiling water. Cover the bowl using a plate or plastic wrap for about 5 minutes, or until the couscous has absorbed all of the water. Fluff the couscous using a fork. Season the couscous with salt and pepper, sprinkle in the chopped parsley, and squeeze in the lemon juice. Serve alongside the pork cutlets. And, greetings! My name is Matt and I'm the gentleman who handles the fine beverage (i.e. booze!) bit on Food Tastes Yummy, where I write "Matt's Wine Not!" and "Matt's Beer We Go!" Keeping within a $20 price limit and covering products from all over the world, my columns are written with the average, normal person in mind. With a definite lack of expert opinions, advice, and without finicky taste observations (no subtle hints of freshly tilled earth or leather here! ), I try various beers and wine and review them in a fun, helpful manner to discover which ones are yummy and which ones are not. My take on wine and food is this: drink whatever the heck you want with whatever the heck you're eating. I throw all the "rules" out the window. Will the wine I review be to everyone's taste with Nancy's recipe? Maybe not -- but still, I found the pairing quite nice. 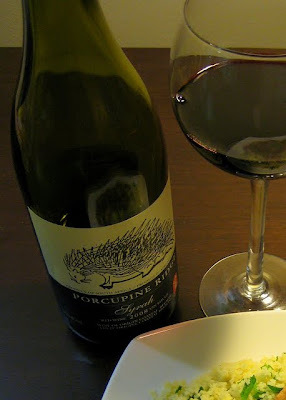 The wine I paired with the pork is a South African wine, Porcupine Ridge 2008 Syrah. Never heard of it? Neither had I! Like many wines I see these days, this one comes with a screw top cap for ease of opening (and closing, opening some more). When poured into your glass, one greeted with a deep cherry red coloring. will enjoy this very much!" Well, don't mind if I do! Taste time! This red wasn't toooo dry initially (those extra "o's" make a difference), whose alcohol is balanced nicely with the fruits inside the wine. There are distinct spicy kicks and almost... hmm... woodsy? flavors in this wine, as well. Having gone down the hatch, however, a noticeable dryness does take over, with some definitely sharpish bitterness, making the aftertaste perhaps not as enthralling as the initial flavor. 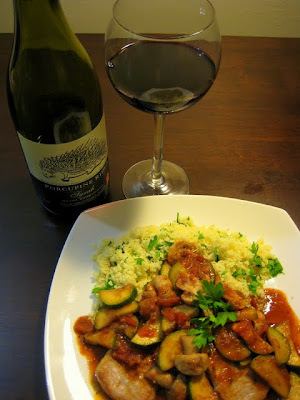 In pairing with the pork, I found the "natural" (specifically, the woodsy and spicy) flavors ery nice with the light gaminess of the pork, with the pork and the couscous taking the edge off the wine. So, there you have it! That's our take on a good wine and food pairing. Next time you're going to cook a meal and you're thinking about what wine to pair it with, just think about what tastes good to you. If your palate says "yes," we say you've got a a match!